Lillian Hellman was a popular playwright whose most successful works were created between the 1930s and the 1960s. She also published several bestselling volumes of memoirs. Several of her plays were made into films. Ms. Hellman was equally famous for refusing to testify before the House Un-American Activities Committee in 1952, and for her long romantic relationship with Dashiell Hammett. She also conducted a lengthy feud with writer Mary McCarthy. Lillian Hellman is currently considered a "single author." If one or more works are by a distinct, homonymous authors, go ahead and split the author. 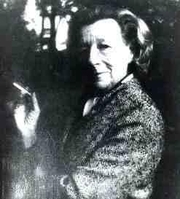 Lillian Hellman is composed of 10 names. You can examine and separate out names.